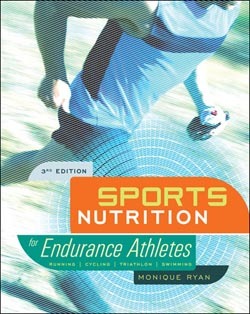 Internationally recognized sports nutritionist Monique Ryan has updated her best-selling book Sports Nutrition for Endurance Athletes with 5 years of new research that will help runners, cyclists, triathletes, and swimmers perform at their best. Weighing in at 432 pages, this newly updated third edition is the most comprehensive resource on nutrition from the best qualified nutritionist in endurance sports. The book is now available in bookstores; bike, tri, and running shops; and online. Download a free preview at www.velopress.com. Sports Nutrition for Endurance Athletes makes high-performance nutrition simple for running, cycling, triathlon, and swimming. Ryan offers clear answers to the most fundamental questions in endurance sports nutrition-What should I eat, how much, and when?-based on the latest research and experience from her 30-year career advising elite and age-group athletes and pro sports teams. She offers fine-tuning strategies for training and racing, optimal recovery, weight loss, and boosting strength-to-weight ratio. Citing rigorous and reputable studies, Ryan busts myths about ergogenic aids and supplements and offers a dose of reality for practices like fat loading and glycogen-depleted workouts. Since endurance sports are too different for a "one size fits all" food plan, Sports Nutrition for Endurance Athletes reveals how runners, cyclists, triathletes, and swimmers should fuel differently to gain real performance advantages in their sports. Even within each sport, optimal nutrition varies with the type and duration of events, so Ryan explains nutrition for short- and long-course triathlon; road, criterium, and mountain bike racing; 10K, half-marathon, and marathon races; and sprint and distance swimming. This complete guide addresses a wide variety of special nutrition considerations for younger and older athletes, diabetics, vegetarians, pregnant women, and those with celiac disease or gluten intolerance. Sports Nutrition for Endurance Athletes also offers six appendixes of reference material including the glycemic index, a vitamin and mineral glossary, an up-to-date comparison of popular sports nutrition products, and sample menus. Smart nutrition can make the difference between a personal record and a lackluster season. Both committed athletes and newcomers to endurance sports will find Sports Nutrition for Endurance Athlete to be a comprehensive, easy-to-use guide to better performance in running, cycling, triathlon, and swimming. Paperback with 2-color tables and illustrations throughout. Monique Ryan, MS, RD, LDN, CSSD is an internationally recognized sports nutritionist with nearly 30 years of professional experience helping elite- and age-group endurance athletes and professional sports teams to optimize their nutrition. She is the founder of Chicago-based Personal Nutrition Designs and the best-selling author of Sports Nutrition for Endurance Athletes, Performance Nutrition for Winter Sports, Performance Nutrition for Team Sports, and Complete Guide to Sports Nutrition. Ryan has worked with USA Triathlon, USA Cycling, Synchro Swimming USA, the Timex Multisport Team, Chicago Fire MLS Soccer Team, and four professional cycling teams. She is a trusted source for nutrition stories in New York Times, Chicago Tribune, Runner's World, Fitness, Men's Journal, Men's Health, Outside, and Oxygen.